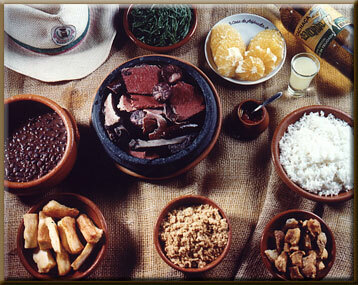 Feijoada is a stew of beans with beef and pork meats, which is a typical Portuguese dish, also typical in Brazil, Angola and other former Portuguese colonies. The name comes from feijão, Portuguese for "beans". Left: Brazilian Feijoada and common accompanying dishes. In Brazil, feijoada is considered the national dish, which was brought to South America by the Portuguese, based in ancient Feijoada recipes from the Portuguese regions of Beira, Estremadura and Trás-os-Montes. This stew is best prepared over slow fire in a thick clay pot. The final dish has the beans and meat pieces barely covered by a dark purplish-brown broth. The taste is strong, moderately salty but not spicy, dominated by the flavors of black bean and meat stew. In Brazil, feijoada is traditionally served with rice, and accompanied by chopped refried collard greens (couve mineira), lightly roasted coarse cassava flour (farofa) and a peeled and sliced orange. Other common side dishes are boiled or deep-fried cassava, deep-fried bananas, and pork rinds (torresmo). A pot of hot pepper sauce is often provided on the side. The meal is often washed down with cachaça, caipirinha or beer. The basic ingredients of Portuguese feijoada are beans and fresh pork or beef meat. In northwest Portugal (chiefly Minho and Douro Litoral) it is usually made with white beans; in the northeast (Trás-os-Montes) it is generally prepared with red (kidney) beans, and includes other vegetables such as tomatoes, carrots and cabbage. The stew is best prepared over low heat in a thick clay pot. Portuguese feijoada is usually served with rice and assorted sausages such as chouriço de carne, morcela (a blood sausage), farinheira and others, which may or may not be cooked in the stew.